It’s the moment that every prospective adoptive parent lives for: Getting the call that a pregnant woman has chosen you to adopt her baby. But what happens next? What should you do? How should you feel? For most hopeful parents, it’s a tricky situation. Naturally, you’re excited. Who wouldn’t be? But at the same time, you know there’s a very real possibility that the woman could change her mind and the whole thing could suddenly fall through. Or that it could be a scam. I was thinking about this yesterday after a hopeful parent on our sister site announced that she had been chosen by an expectant mother. She described her mood as “cautiously optimistic,” which I think is the perfect response and strikes just the right balance, given the circumstances. After all, if there’s one thing you can say about the adoption process, it’s this: things have a way of getting pretty crazy pretty quickly. Expecting the unexpected isn’t just a mantra. It’s a way of life. Every prospective parent will react differently to being chosen by a pregnant woman with an adoption plan. That said, here are three things to keep in mind. 1. A match isn’t an adoption. For a waiting parent, there’s nothing more exciting than being chosen by an expectant mother with an adoption plan. It’s so thrilling you want to go out and shout it from the rooftops. But before you do, before you throw that baby shower or start picking out baby names, remember that a match isn’t an adoption. Although a woman can create an adoption plan at any time during her pregnancy, the placement itself can’t take place until after the baby’s birth. And that’s where things get complicated. I don’t know what the statistics are, whether 5 or 50 per cent of adoption matches unravel prior to placement, but it doesn’t really matter. Even if the figure is .000000001 per cent and you happen to be that person, it’s devastating. Every adoptive parent who goes into the open adoption process knows that’s one of the risks you have to take. (In fact, it’s the main reason most hopeful parents decide not to go down this adoption path). And yet once you find a match, it’s easy to push aside these thoughts and convince yourself that it won’t happen to you — that the woman you’ve been matched with is totally committed to her plan. Or that she’s fits the profile of a birthmother to a “T.” Or that she has vowed that she would never ever do that to you. She may not. She may not mean to or want to. But it’s still too early to tell, especially if she’s early in her pregnancy. I don’t want to be a killjoy, but you still have a long, hard road ahead of you. 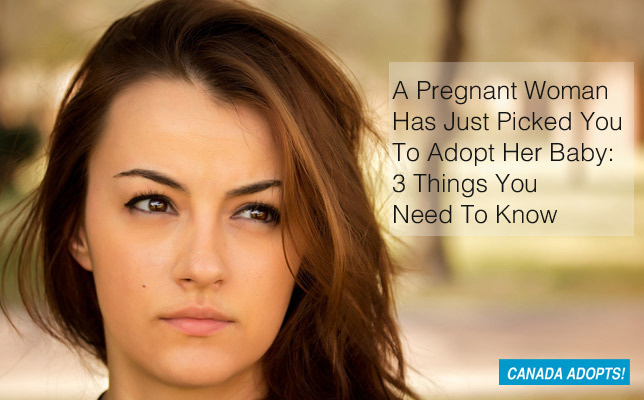 Assuming it’s not a scam — that the woman who has contacted you really is pregnant and really does have an adoption plan — there are still many unknowns you need to work out. Her personal situation may be in flux and other developments could pop up that could change her plans. For instance, she may reconcile with the baby’s father. Or her parents may decide to help her out. Or she may decide that it’s just too hard to part from her child. They’re all possible and they’re all within her rights as an pregnant woman. 2. An expectant mother makes her decision to place twice. It’s true: tThe first time is when she’s pregnant, and the second time is after she gives birth. It’s one thing to create an adoption plan, or even to feel your baby kick. But it’s something else completely to give birth and to hold that baby in your arms. Until then, adoption is just an idea. Giving birth, however, makes it real. Holding your baby in your arms, gazing into her eyes, hearing her cry for help — they create a connection, an emotional tug that’s hard to resist. Placing that baby in the arms of another person and not knowing for sure whether you’ll ever see her again is for some new mothers too big a burden to bear. And that’s why many women change their mind and decide to parent, even though prior to the birth they were totally at peace with their decision and promised you they would never go back on their decision. 3. You also have the ability to change your mind. Expectant parents aren’t the only ones who can change their mind about a match. As a prospective parent, you can too. Yes, to do so may seem inconceivable at this stage in your adoption journey, after everything you’ve gone through. But in some cases, it’s not an option, it’s a necessity. There are all kinds of situations where you feel like you don’t have any other choice. Maybe you don’t feel comfortable moving forward with your plan because the expectant mother has substance abuse problems or you feel like she’s manipulative and making unreasonable demands on you, or her child has serious medical issues that go beyond your capabilities, or there are complications with the expectant father that could put the placement at risk. Walking away from an opportunity isn’t easy. You may have doubts about whether you’re making the right decision or you may even feel guilty about it. But at the end of the day, you’ve got to go with your gut. And if your gut tells you that this isn’t the match for you, if something about it doesn’t feel right, you need to listen to it and move on. So knowing all this, what should you do? They’ve been through these situations before. You haven’t. Plus, because they’re not emotionally invested in your match, they can spot problems long before you can. From the first call until the last, keep them in the loop and turn to them for guidance, expertise and support. Prepare yourself for ups and downs — phone calls missed or not made at all. It’s all part of the process. Some things that you may see as a bad sign (not hearing back from the expectant mother for several days, for instance) may not be anything at all. So avoid the temptation to overthink things. It won’t change the situation. All it will do is drive you, and those around you, crazy, and add more stress to an already stressful situation. There’s nothing you can do to prevent an expectant mother from changing her mind. If that’s her decision, all you can do is respect it and wish her well. However, there are things you can to prepare yourself for that eventuality and increase your odds of success. One is to make sure she gets all the education and support she needs. The more she knows about the process, the more secure she will be in her decision-making. One regret that many adoptive parents say they had after becoming parents is that they wish they had enjoyed the pre-placement period more. Instead of spending all of their time worrying about the things that might have gone wrong, they say they wished they had just let go and lived in the moment. Being chosen by a pregnant woman is the closest that most adoptive parents will ever come to experiencing a pregnancy. So take advantage of it as much as you can. If possible, accompany the expectant mother to her doctor’s appointments, help her pick out things for the pregnancy, and volunteer to babysit. Be there for her and work on creating a genuine bond and building a future that you can look toward to and be proud of. Getting asked to adopt an expectant mother’s baby can spark an odd mix of emotions, including excitement, fear and even despair. If you find yourself in this situation, take things slowly, put yourself out there, and be cautiously optimistic as you wait for the process to unfold. Prepare yourself for the worst. But always, always hope for the best.